Having a light box at my library circulation desk just makes perfect sense! I can let students easily know what’s happening or simply throw in an inspirational quote. There are plenty of people creating light box slides, but no one was creating them for the library…until now! This is a growing bundle, that I will be adding to as the school year progresses. Hurry now though, as the price will be going up August 31st (updates are FREE! So grab this resource at the lower price). I have a road trip coming up and will have 6 hours (each way) of time to fill…and creating more slides is part of my plan. 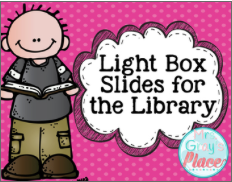 Easy to print, cut and use light box slides that are perfect for your library. This set will be growing, as events happen in my library. Sized to fit your Heidi Swapp Light Box.